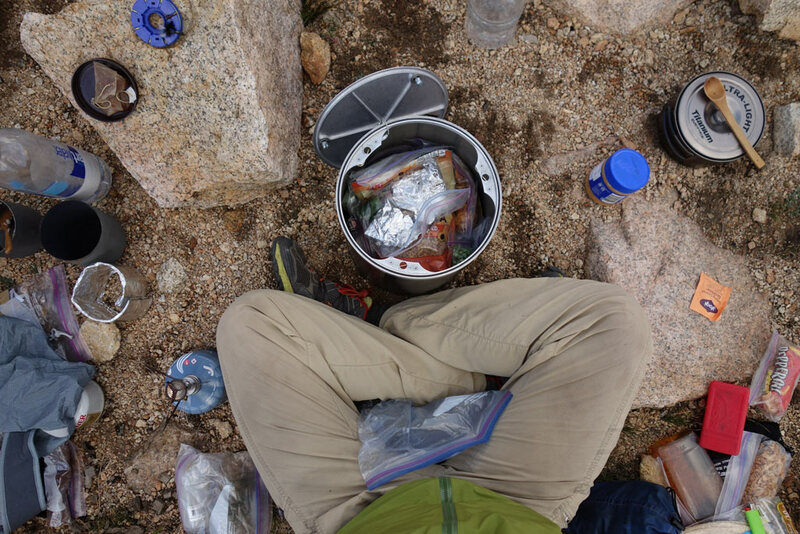 On most of the PCT, you are required to properly protect your food. It is important to know and follow the food storage regulations for the areas you are traveling through while on the PCT. The bottom line is that these regulations are in place to protect the wildlife, as well as the trail experience for future backcountry travelers. The PCT traverses bear habitat. In places, bears have become adept at gaining access to improperly stored food. Access to human food, either through improper or inadequate food storage, sometimes ends with managers having to kill bears that become too habituated to going after human food. Proper food storage is paramount to a safe, successful trip; it ensures your personal safety and protects one of our wildlands greatest mammals. Resident PCT bears are legendarily good at getting human food. 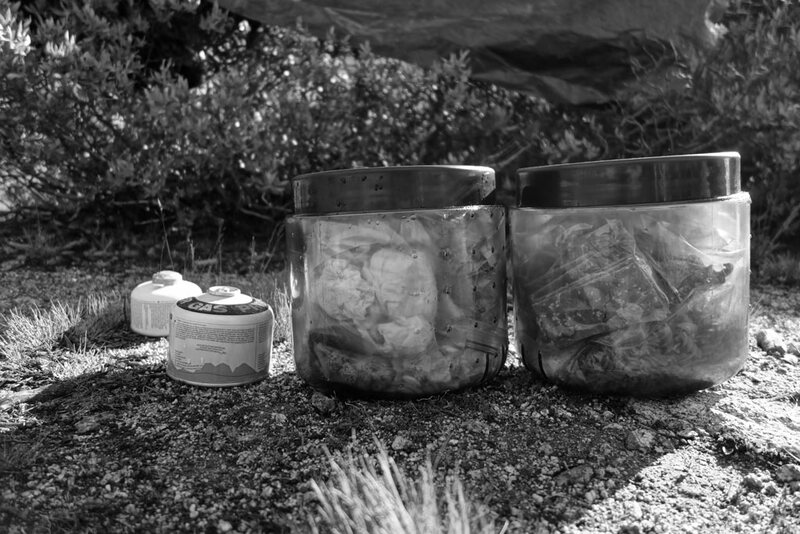 In some of regions along the trail, all scented items MUST be in a bear canister. Where they’re required, these canisters must be on the list of allowed canisters published by that land management agency. The number of black bears has increased steadily in recent years. In California, the bear population has grown from about 10,000 in the 1980s to around 35,000 now. Their range has also expanded. In places where you didn’t use to worry about bears getting your food, there are now bears. Bears are at home in the mountains of the PCT from the southern deserts to the northern border. Before your trip, plan ahead and prepare by inquiring about food storage regulations for the areas in which you will be traveling. Regulations and appropriate protocols differ in places along the trail. Where are bear canisters required on the Pacific Crest Trail and John Muir Trail? Bear canisters are required in parts of Sequoia and Kings Canyon National Parks, Inyo, Sierra and Humboldt-Toiyabe National Forests, and in all of Yosemite and Lassen Volcanic National Parks. Basically, a typical long-distance PCT hiker and horseback rider should, at the minimum, carry canisters between Kennedy Meadows (mile 702) in the south and Sonora Pass (mile 1017) in the north and then again in Lassen Volcanic National Park (mile 1343-1363). If you’re hiking the entire John Muir Trail, that’s the entire way. ALL of your food and scented items must be in the canister once you make camp. If you’re only visiting portions of the Sierra, you’re welcome to research which locations don’t require hard sided canisters – though we still encourage you to carry them in places that they’re not required. Read our more about the bear canister requirement in Lassen Volcanic National Park. Most visitor centers in the area offer extremely cheap rentals. Can I store my food in the food lockers instead of carrying a bear canister? There are food lockers in the backcountry but they are few and far between. The food lockers exist in case you have overflow food. Using them doesn’t mean you should hike without a canister. Hikers may be able to get away with using food lockers in SEKI if they are also hanging food in those areas where bear canisters are only ‘recommended’. The last bear locker in Yosemite is at Glen Aulin, a mere 5.5 miles from Tuolumne Meadows, so even if you plan on staying the night at Glen Aulin, Yosemite National Park will still require you to have a bear canister between there and Sonora Pass. In Lassen Volcanic National Park, there are no bear lockers in the backcountry but you can opt to camp in the developed campground in Warner Valley instead of camping in the backcountry. In other words: There are food lockers in the backcountry. There are not enough food lockers in the backcountry to support the bear canister requirement. Yosemite is one of those places. In the zones where bear canisters are required, you have to have them. Can I use a canister, “odor proof” bag or another solution that is not on a list of allowed canisters? You’re more than welcome to use other devices where canisters are not required. But where they’re required, you’ll have to use an allowed canister. Considering that bears can smell soup inside of a can, or a footprint that was left weeks ago, it’s highly suspect that a plastic zip-top bag does much good at all. Other food storage options and products, like chew resistant bags, while great in many places, are not on the allowed bear canister lists. Is it true that I can just claim to be a day hiker if I meet a ranger? Wouldn’t that be sneaky! But no, this scheme doesn’t work. Beyond harming bears, it’s just not allowed. This obvious deception doesn’t work because if you have overnight gear, you’re automatically an overnight user. You can’t be a day-hiker if you have an overnight pack. Anytime you’re backpacking in the area with overnight gear, you need an overnight permit and a bear canister. You might claim to be a day hiker, but you’ll still get a ticket. The situation is slightly different in Lassen Volcanic National Park, so be sure to read up about it. I hear that there are no rangers. Can I just sneak through the area? There are indeed backcountry rangers! They’re great people! They’re true wilderness lovers, avid backpackers and have the honor of working a dream job. They’re also focused on the PCT and JMT since that’s where a lot of people are backpacking. You’re likely to meet them. Since they live out there, it’s not a 9-5 job. You could meet them at any time in any place. Can I just carry the smallest canister and call it good? The goal is to not feed bears. With that, all of your food and scented items need to be in a bear canister. It might seem like having a canister period, like the smallest one, is good enough. Unfortunately, it’s not. Bears may eat your other food, and you’re not even following the requirement of having all of your food in the canister. What do I do if my bear canister isn’t big enough? A common problem! 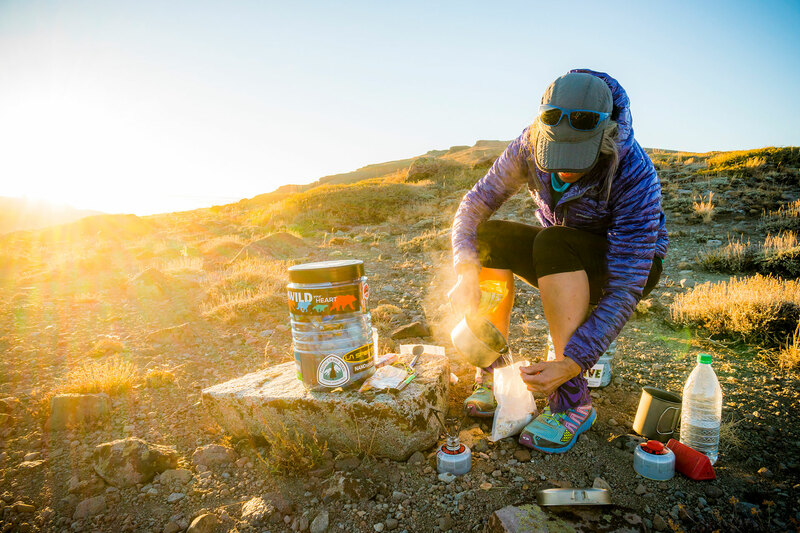 You’ve got a few basic solutions: resupply sooner (hike faster, or a shorter distance), carry more compact food (mmmm… couscous), or get a bigger canister. Thankfully, your first day and night’s food doesn’t need to fit in your canister. Beyond that, there really isn’t a magic bullet. Other tips include: repackaging food and careful meal planning that decreases bulk and waste. Can I just refuse to show the rangers my bear canister? We hope you’re not coming out to the woods to have a confrontation. Rangers have the right to ask you to prove if you have a bear canister, and many of them will. If the ranger can’t ascertain that you’re following the law, you’ll be getting a ticket and you’ll likely be sent back to the trailhead. A confrontation is likely going to result in a mandatory appearance ticket, meaning you’ll have to go to the courthouse at a later day. This is highly inconvenient. Rangers might ask to feel your pack or knock on your pack if it’s not obvious that you have a canister. Tickets are not rare at all. In fact, they’re far too common. Do the right thing for the bears, leave the bear canister drama at home and carry a bear can. Regulations and decent hiker ethics stipulate that you must properly protect your food, often times in a very specific way. Defending your food by keeping it in your tent or on the ground nearby is often ineffective, unwise, and does not meet the requirement. Generally, you should keep your food in a bear canister, or hang it using the counterbalance method. Hard-sided canisters are the most effective way to protect your food. They’re the best choice for most of the trail. Problem is, they’re heavy and bulky. While we encourage you to carry a canister, especially in bear country, we understand that you might forgo them on sections of the trail. In areas without trees and without bears (think parts of Southern California) protecting your food from rodents and small mammals should be your primary concern. In this instance, it is usually sufficient to hang your food a few feet off the ground. The goal is to get it at least waist high. Bear and rodent resistant bags are also an option where hard sided canisters are not required if you do not want to employ counter-balance bear hangs. Please remember, it is best for the wildlife, your trip, and your health, to protect your food.